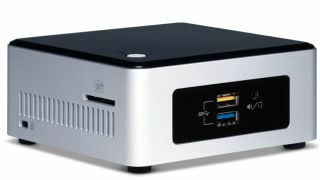 Pricing for Intel's new range of entry level NUC (next unit of computing) have emerged in the US and in the UK. The NUC5CPYH and the NUC5PPYH both run Braswell CPUs, which are built using the same advanced 14nm technology as their more expensive siblings that often power Ultrabooks. The first model runs a dual-core Celeron N3050 CPU at 1.6GHz while the other model is powered by a quad-core Pentium N3700 CPU clocked at 1.6GHz. Both models support USB 3.0 (they have four of them), DDR3L-1600 (up to 8GB), HDMI 1.4a which supports 4K, GbE port, a SD card slot, an infrared sensor, support for a 2.5-inch drive, a TOSLINK jack, 802.11ac, Bluetooth 4.0 and a three-year warranty. Surprisingly, Intel chose to include a VGA port rather than a DisplayPort. That's because a lot of displays out there (including a fair few projectors) still sport that legacy connector. Amazon listed the cheaper model for $129 (about £80, AU$160) but it now shows as being unavailable. In the UK, one little known shop listed the Celeron-based NUC for £105 (about $150, AU$200) and the Pentium-based one for £150 (about $225, AU$300). Another affordable compute solution from Intel is the Compute Stick which comes with storage and an OS but doesn't offer either the performance or the expansion capabilities of the NUCs.